Get notified when Fiesta Bowl tickets are available! 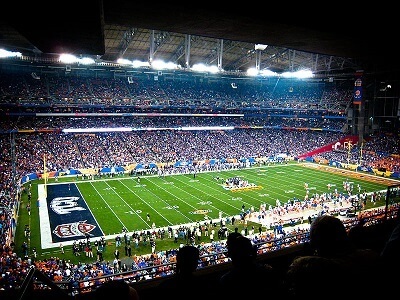 The Fiesta Bowl is a United States-based college football bowl game that is played once a year at the University of Phoenix Stadium in Glendale, Arizona. This stadium can seat up to 72,200 people with ease. Between its founding and the year 2006, it has been played at Tempe, Arizona. Alongside the game, the Fiesta Bowl Parade takes place in downtown Phoenix that includes high school marching bands, floats, and a seven-member queen and court. If the idea of a football game and a downtown parade sounds appealing to you, you can use the links above to find Fiesta Bowl tickets and see it for yourself!